Recorded and mixed by Mary Dunayer at Musecat Studio, New York. For the last 30 years Cecil Taylor has been an idol of mine. His playing inspired me to keep on searching and to reach for the stars. This album is a culmination of my 30 years of free-form playing. To some free-form means atonal, but it’s not. It is culmination of notes that can be beautiful or (to some ) ugly. But it is free, meaning not in time, no time signature. Just as Sigmund Freud used free association, that’s what free players do. It is easier to listen to a solo artist than it is to a quartet. If it is a good quartet, each musician would listen to each other and play off of their compatriots. If they don’t listen, then it sounds like a mish-mash of nothing. Is it avant-garde? Sometimes, but free playing has been going on throughout the centuries. Is it accepted in today’s society of pop induced music? Not all the time. There is a limited audience for this music. Cecil Taylor, who was raised in Queens NY, and ended up at the New England Conservatory of music where he studied classical composition, was heavily influenced by the music of Bartok and Stockhausen. When he came back to New York with his brand of jazz (improvisation), he was snubbed by the jazz community. Slowly he began to work and introduce chord clusters and playing in a more percussive way. He was finally accepted for the genius he was. His solo performances were regaled as extraordinary. A usual high energy set would run close to an hour. That’s what I attempted to do. But using four free improv solos. The first three are very long and the last piece is short. I ask that you keep an open mind to what you are going hear. I don’t use any effects. It is sheer open improv. Cecil played piano and I am playing guitar. There are some things I just can’t do because it is a guitar. I feel I came close to what Cecil would have done. 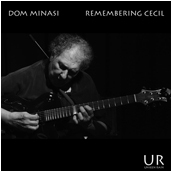 I would like to thank Mary Dunayer of Musecat Studio for a splendid job of recording and mixing and Jack DeSalvo of Unseen Rain Records for producing and releasing this Recording. A special thanks to German Aprile for making an extraordinary guitar that I love to play and to Valeria Marchese for cover photo. My only regret is that I didn’t have a chance to play with Cecil. He passed away on April 5th 2018.